Let Them Eat Cupcakes! The Sugar Dolls Bake Up a Scrumptious Saturday in L5P! When ATLRetro heard that The Sugar Dolls were throwing their 2nd Annual Day of the Cupcake party on Saturday Oct. 8, we couldn’t think of a more delicious way to officially kick off our latest weekly feature, the Wednesday Happy Hour & Supper Club. While a holiday just for this Retro sweet sounds scrumptious enough, this quintet of beautiful bakers (Alexis Gorsuch, Lena Kotler, Crystal Chambers-Goggin, Jessika Cutts and Kelli Graham) has cooked up an entire day of activities, starting from noon to 7 p.m. at Sacred Heart Tattoo in Little Five Points and then continuing late into the night at Java Lords ($5 cover; proceeds to Atlanta Bully Rescue). 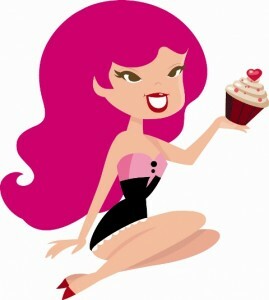 They’ve tempted you with everything from boobalicious chocolate confections to flaming strawberries at Blast-Off Burlesque shows, Mon Cherie spectaculars, Rockabilly Luau, but Saturday will be all about celebrating the cupcake through activities, art and music. You’ll lick your lips for cupcake-inspired games, a Sugar Skull decorating room so you’ll be all set for the Day of the Dead, tasty tattoos, live bands (including Six Shot Revival, The Sneaky Hand and The Claymores), karaoke, burlesque, pin-up hair-styling with Cherry Dame, a pin-up contest and, of course, cupcakes! In fact, the idea of spending a day celebrating this timeless treat made us so hungry that we asked the Sugar Dolls if they’d be so sweet as to add ATLRetro to the menu as a sponsor. We’re thrilled to say that we passed their taste test, especially since we’ll be serving up a tasty new look at the end of this week, courtesy of Derek Art, too. That it’s Anya99’s birthday two days later is just icing on the cake, and she really loves icing, so while you’re dropping by for cupcakes, be sure to say hi. We’ll also be selling our first batch of ATLRetro T-shirts, so if you dig what we’re doing, consider buying one and supporting our humble efforts to keep Retro Atlanta alive. With an all-day event, it’s sometimes hard to know when’s the best time to show up, so we asked Alexis to clue us in on all that’s cooking on Saturday. Of course, we couldn’t resist a few questions about the perennial appeal of the cupcake and the secret recipe behind the Sugar Dolls’ secret origin and success. For a while, cupcakes seemed to have a bad reputation as being cheap alternatives instead of a real cake and mostly just for kids, but lately this quintessentially Retro treat is not just back in style, but as The Sugar Dolls have shown, can come in all sorts of creative flavors, even in adult versions such flaming with a drop of liqueur. What do you think accounts for their comeback? Trends in fashion loop around so many years and I have been told on numerous occasion, it is due to nostalgia. “Fashion is not something that exists in dresses only. Fashion is in the sky, in the street, fashion has to do with ideas, the way we live, what is happening.” By Coco Chanel. So what is more nostalgia than food, needless to say sweets? You nailed it on the head with the fact that cupcakes are Retro, but aside from that they have given us a sweet and simple way to step back to the past yet enjoy where we are and look forward to the future! I love how some of our sweets take me back to being a little girl, but the same cupcakes are the most elegant wedding display or engaging party favor. So much diversity in these simply amazing treats and people are really starting to recognize the possibilities and fun at reasonable budget. So honestly it is a nice handful of things that has really allowed these sweet cuppies to bloom into their own world. 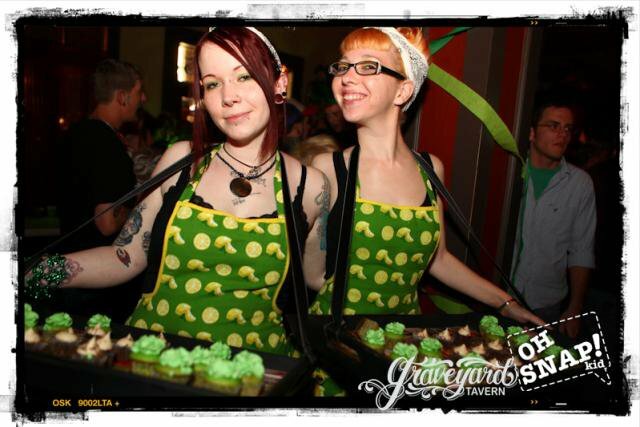 We can’t think of a better name for a cupcake company than The Sugar Dolls. How did you gals get together and what made you start baking? Thank you, we are pretty fond of the name too! Well, baking is such a sweet family tradition for so many folks, and all of the Dolls have some great memories and continue to make them together and with our families. We all met at different walks in our life but seem to have come together to make something bigger than ourselves. We want to share our love and experiences with you, and baking is the sweetest outlet to share those things and give in the many ways we would like.